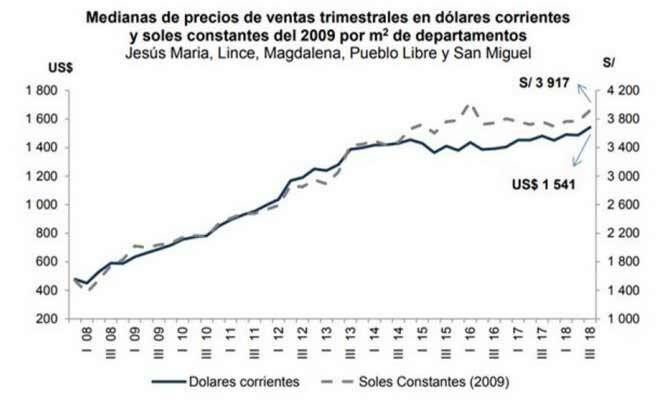 According to the latest report of the Peruvian Central Reserve Bank (BCRP) the purchase price in Peruvian Soles of homes per square meter in Lima’s 5 top districts – La Molina, Miraflores, San Isidro, San Borja and Surco – increased 2.6% in the third quarter of 2018 compared to the same time period in 2017 and even 4.6% in comparison with the second quarter of 2018. The same applies to home prices in US$. Here the increase in Lima’s top districts was 2.5% in the third quarter of 2018 compared to the same time period in 2017 and 4.3% in comparison with the second quarter of 2018. A similar situation could be observed in Lima’s middle-class districts – Jesus Maria, Lince, Magdalena, Pueblo Libre and San Miguel. 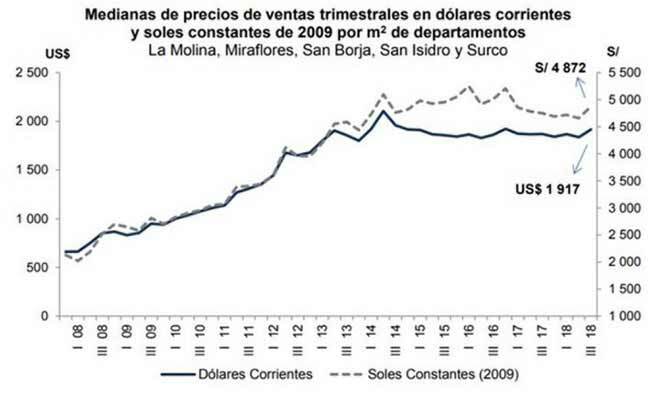 In the third quarter of 2018 the Soles purchase price per square meter increased 4.2% compared to the same time period in 2017 and 4% in comparison with the second quarter of 2018. Home prices in US$ in Lima’s middle-class districts rose 4% compared to the same time period in 2017 and 3.7% compared to the previous quarter. The BCRP report also shows that on average the purchase price of a home is equivalent to 17.5 years of rent or for investors rental income.